ST. PETERSBURG, Florida - Minor League Baseball today named the Lexington Legends the recipient of the fifth annual John Henry Moss Community Service Award. The award was created in 2013 by Minor League Baseball in honor of the late John Henry Moss, who founded what would become the South Atlantic League in 1959 and headed the circuit until 2007. The Legends will receive their award at the Baseball Winter Meetings Banquet on Sunday, Dec. 10, at the Walt Disney World Swan & Dolphin Resort in Orlando, Florida. 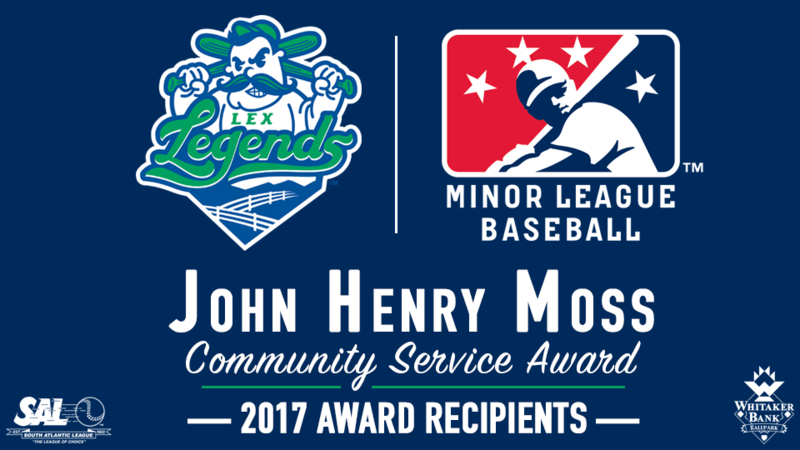 "The Lexington Legends are incredibly proud to receive the 2017 John Henry Moss Community Service Award, and furthermore, we are honored to represent the South Atlantic League and its former President, John Henry Moss. One of the Legends' core values is to give the community more than they expect, and we feel it has truly been our honor to serve Central Kentucky," said Legends President & CEO Andy Shea. "The 2017 season was a team effort, from the front office, to the Legends players, to the Kansas City Royals, we came together and created a unique and well-rounded outreach plan. Our "Stache Tank" program led the way by providing elementary, middle and high school students in underserved communities the chance to develop entrepreneurial ideas in the form of Legends giveaways, concessions items and gameday planning. We look forward to continuing this impactful and important tradition of community involvement for many years to come." "The Lexington Legends do a wonderful job of engaging the Lexington community, and the entire Central Kentucky region, through their community service, charitable foundation and outreach programs," said Minor League Baseball President & CEO Pat O'Conner. "Their philanthropy and charitable contributions throughout Central Kentucky reach countless numbers of organizations and community-based programs. The Legends' community leadership and support are truly remarkable and it is my honor to present them with this award." In addition to the award, Minor League Baseball Charities will make a $2,500 donation on behalf of the Legends to the University of Kentucky Sanders-Brown Center on Aging, as they work to improve the health of the elderly through research, education, outreach and clinical programs. The Legends' staff strives to give the Lexington and Central Kentucky communities more than they expect, and in 2017, the Legends provided $1,083,214 in monetary and in-kind donations to Central Kentucky and the surrounding regions, a 21 percent increase over their 2016 donation total. In their 17-year history, the Legends have donated more than $13 million in monetary and in-kind contributions to non-profit organizations and communities in the region. In recognition of their commitment to the community, the Legends claimed the South Atlantic League Community Service Award in 2017 and 2013 and the South Atlantic League Club Merit Award in 2016. One hundred percent of the Legends' front office staff serves or participates with at least one charitable or civic organization. During the season, the Legends feature one local non-profit organization at each of their 70 home games. The participating charities receive a table on the concourse, a pre-game interview on the field and an in-game radio interview to help promote their cause. 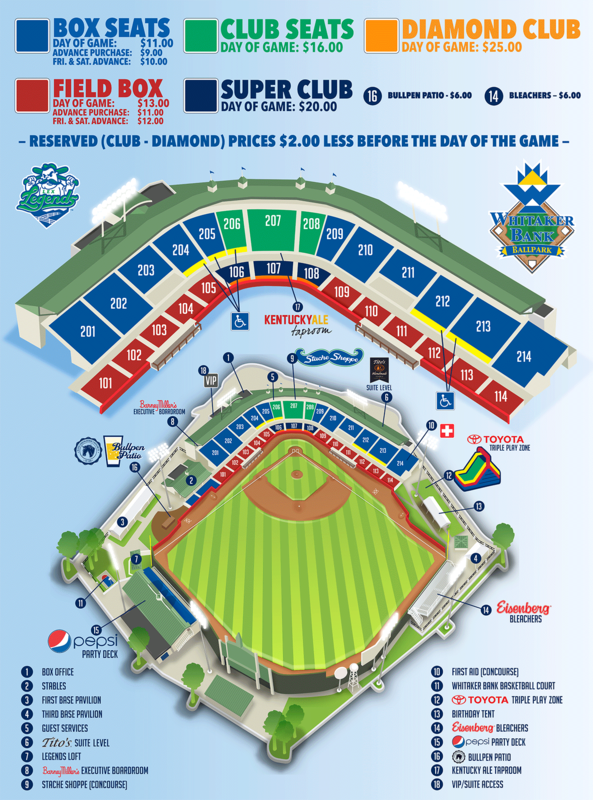 Additionally, the Legends use Whitaker Bank Ballpark to host a long list of charitable events, including fundraisers for breast cancer research, the Salvation Army, the American Heart Association, military appreciation events and a police versus firefighters fundraising softball game. The Legends go to great lengths to serve the youth of their community by providing assistance to several educational initiatives which includes a "Hit the Books" reading program, a STEM/STLP based program and Legends Character Awards with local elementary schools. Also included is an entrepreneurial project-based marketing and promotional learning unit called "Stache Tank" with a local elementary, middle and high school, where students are challenged to come up with business pitches for a specific project within budget limitations. These projects are then carried out and come to fruition during the Legends baseball season. Additionally, their mascots, Big L and Pee Wee, made over 200 appearances around Central Kentucky in 2017. Minor League Baseball, headquartered in St. Petersburg, Florida, is the governing body for all professional baseball teams in the United States, Canada and the Dominican Republic that are affiliated with Major League Baseball® clubs through their farm systems. Fans are coming out in unprecedented numbers to this one-of-a-kind experience that can only be found at Minor League Baseball ballparks. In 2017, Minor League Baseball attracted 41.8 million fans to its ballparks to see the future stars of the sport hone their skills. From the electricity in the stands to the excitement on the field, Minor League Baseball has provided affordable family-friendly entertainment to people of all ages since its founding in 1901. For more information, visit www.MiLB.com. Follow Minor League Baseball on Facebook, Instagram and Twitter.